Southwest Airlines Co.’s organizational structure promotes centralized decision-making processes. As a major low-cost carrier with international operations, the company has an organizational design representative of a business configuration that enables strong corporate headquarters in controlling all areas of operations. In this structural system, Southwest possesses a rigid hierarchy that addresses strategic management concerns. The corporate structure facilitates the administration of the aviation company’s resources, including human resources. In its organizational development, starting as a local carrier in Texas and now an international low-cost airline business, Southwest has largely maintained its organizational design and its organizational structure’s characteristics. It is apparent that the company finds its corporate structure ideally applicable to its operations in the transportation sector. Its profitable performance and large operational scale indicate that Southwest Airlines benefits from its organizational structure’s implementation to address business needs and strategic challenges in the international commercial aviation industry. Business strengths, core competencies, and competitive advantages shown in the SWOT analysis of Southwest Airlines Co. are partly a result of human resources and strategic support from the corporation’s organizational structure. In a way, the company uses its corporate structure as a tool to manage operations while competing against firms like American Airlines, Delta Air Lines, and United Airlines. Structural characteristics also facilitate strategic planning and implementation to address trends in the industry, such as those identifiable through a PESTEL/PESTLE analysis of Southwest Airlines Co.
Groups Based On Business Functions. In its U-form corporate structure, Southwest Airlines groups business activities and resources according to business functions. For example, the company has a functional group for finance and another functional group for daily operations in commercial aviation. Aside from these main function-based groups, Southwest’s organizational structure involves subgroups that report to one or more executives. For instance, the Vice President of each of Ground Operations, Inflight Operations, and Maintenance Operations reports to the Executive Vice President for Daily Operations. This characteristic of the corporate structure ensures that Southwest Airlines maintains effective business functions that are arranged in a way that strategically supports the entire organization. An implication of this organizational structural characteristic is the possible creation of new functional groups whenever a new product/service or business area is developed, such as the creation of new international flight routes or new complementary operations in the aviation industry. Centralized Hierarchy. A major characteristic of the U-form organizational structure is a centralized hierarchy, which in this case defines Southwest’s system or arrangement of resource and activity groups and how they relate to each other. For example, at the organizational headquarters, senior executives make the decisions that are relayed and implemented throughout the commercial aviation operations. The corporate structure’s relaying and corresponding lines of authority are vertical (top-down), starting from Southwest’s CEO, down to the rank-and-file employees in daily operations. Thus, the aviation company’s organizational chart represents the CEO and other senior executives at the top of a pyramidal structure, with the bottom groups representing the frontline employees. Centralization ensures the fulfillment of Southwest Airlines Co.’s corporate vision and mission statements in terms of executive control and direction of the enterprise toward strategic goals and objectives. This organizational structural characteristic ensures centralized control on all airline operations. Also, this type of corporate structure aggregates expenditure and minimizes redundancies, thereby contributing to the effectiveness of Southwest Airlines Co.’s generic strategy and intensive growth strategies in using low costs as the main basis for penetrating current markets. Advantages. An advantage of Southwest Airlines Co.’s organizational structure is the strong control that corporate executives have on operations. Control is achieved through the hierarchy and functional groupings that correspond to the different areas of the airline business. Another structural advantage is the redundancy minimization in Southwest’s operations through aggregation of activities and resources based on similarities in business function and strategic objectives. Minimized redundancy allows the company to avoid unnecessary costs in its airline operations. Disadvantages. A disadvantage of Southwest Airlines Co.’s corporate structure is the limited organizational flexibility, which is typical in traditional businesses with unitary structural forms. For example, the organizational structure comes with strong strategic management control, but at the expense of flexibility in allowing various organizational areas or components to change operational tactics and strategies to suit the daily challenges they face in commercial aviation operations. In addition, Southwest Airlines Co.’s organizational culture, which implies teamwork, is not strongly represented in the corporate structural characteristics. This disadvantage is notable, based on the company’s aim of providing a warm and friendly atmosphere to attract travelers. Anken, F., & Beasley, J. E. (2012). Corporate structure optimisation for multinational companies. Omega, 40(2), 230-243. Machado, N., Castro, A. J., & Oliveira, E. (2015). Studying the Impact of the Organizational Structure on Airline Operations Control. In Advances in Artificial Transportation Systems and Simulation (pp. 103-124). Academic Press. Salimova, T. A., Biryukova, L. I., Makolov, V. I., & Levina, T. A. (2015). Conceptual Provisions of Formation of the Quality Management System Within the Integrated Corporate Structure. International Business Management, 9(6), 1129-1135. Southwest Airlines Co. – Form 10-K.
Southwest Airlines Co. – Leadership. 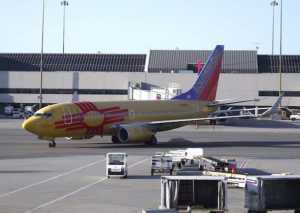 Southwest Airlines Co. – Senior Management Committee. Southwest Airlines Co.’s E-commerce Website. Tran, Q., & Tian, Y. (2013). Organizational structure: Influencing factors and impact on a firm. American Journal of Industrial and Business Management, 3(2), 229. U.S. Department of Commerce – International Trade Administration – The Travel, Tourism, and Hospitality Industry in the United States.